Here's how you can set up and play a Racing Sim tournament on the platform! 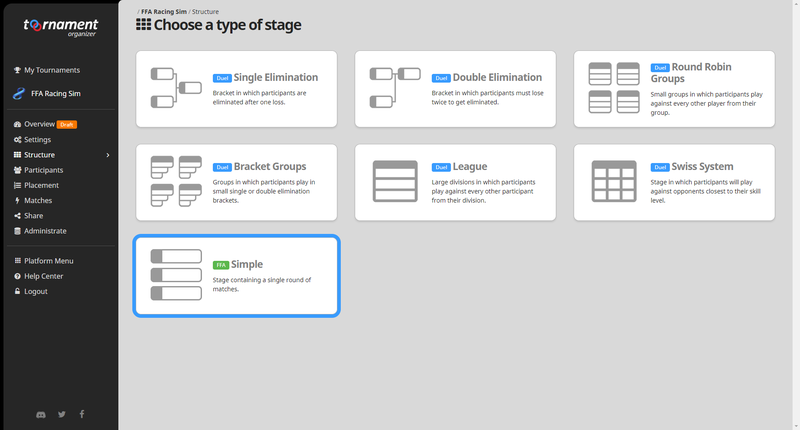 Create a new tournament from your Organizer Dashboard, and select the Racing game of your choice! If you are new to the platform, you should take the time to read our Starter Guide on how to create your first tournament. 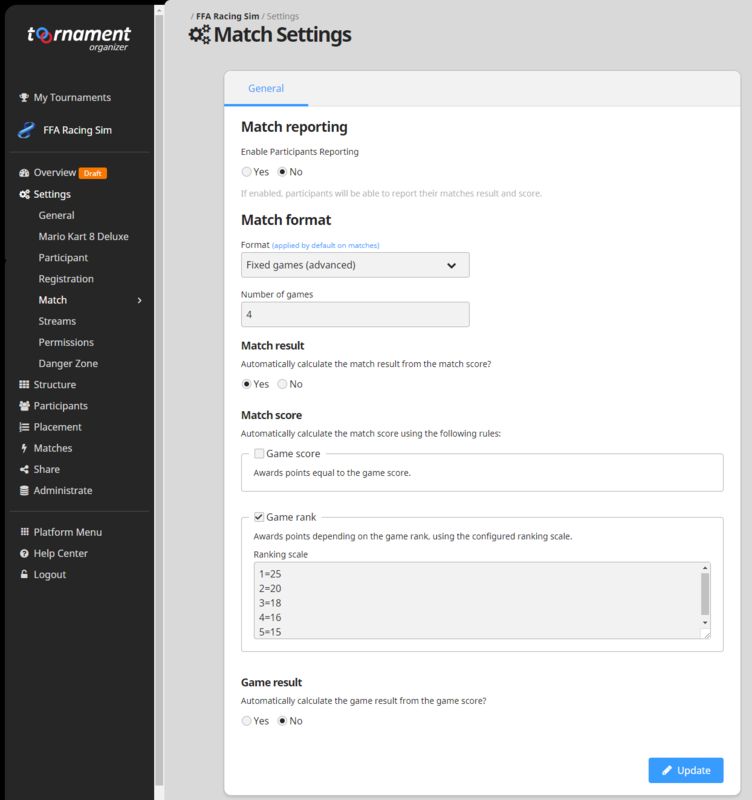 First things first, you have to select the Match Format to be used throughout the tournament, by going to the "Settings" -> "Match" menu. The Fixed Games (Advanced) should accommodate any Racing Sim, and will be your go-to format for free-for-all modes. This way, you will just have to enter the position of each racer in the game, and the system will calculate their points with the scale you provided. With a maximum limit of 4096 players per stage, the Simple Stage is the stage for free-for-all, so head to the Structure menu and create one! The next creation step requires you to give the stage a name, set its size and how many matches are to be played. It is to be noted that a participant can not play in 2 separate matches (and you defined how many games are in a match in the Match Format!). Given the high number of players you can have, we suggest you open the tournament Registrations. Don't forget that Custom Fields are here to help you gather useful information from your registrees. Unless you prefer keeping your tournament private, you have to publish it so it becomes visible to everyone both on the website and the mobile app. You can also get tips and advices on a good promoting campaign in our Share category. Registrees have to get validated to become participantsand be placed in the stage you created. The placement for a Simple Stage works just like for any other stage, and is explained here. Once a race is over, go to the "Matches" -> "Name of your Simple stage" menuand enter the points earned by each participant. You have to use some sort of rule, like what is used for Mario Kart, Trackmania or F1 Championships, with position rewarding points to the racer. 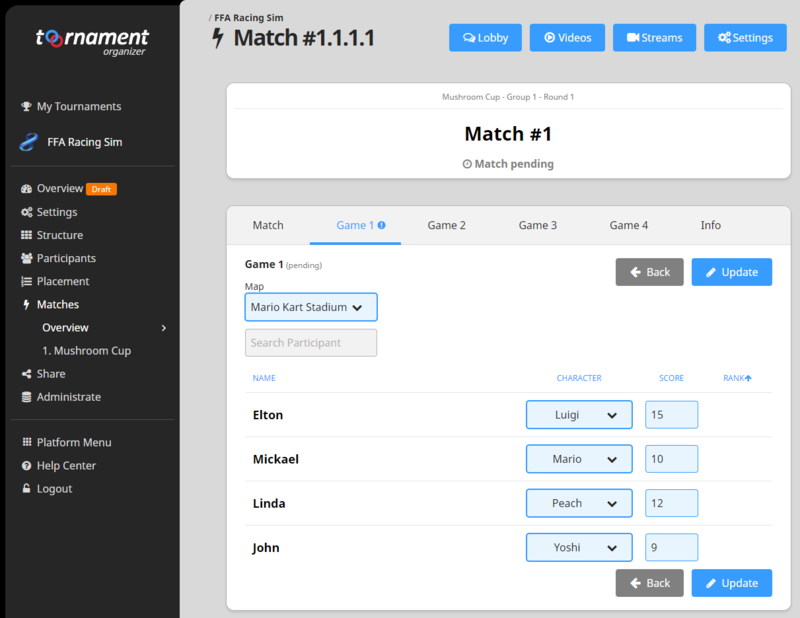 The system will then automatically calculate the rank of players based on the points they earned by finishing the race, and report it to the match level by adding the scores from all races in a match. That's it, you have your Racing Sim tournament going on nicely, keep reporting the races results, and Toornament will handle the rest, ranking participants after each race! If you wish to have a more complex structure, you just have to create new stages, and name them accordingly. For more advanced organizers, or professional ones, we have a free and open API to help you improve your video and/or stream production or create your own management tools. Another visual application of the API would be to use it to create infographics, just like this one for Just Dance World Cup.